Fall Sports Participation is a Winning Strategy for Lexington School Students. Perfection can be a big, confusing word. Our coaches don’t use it much. 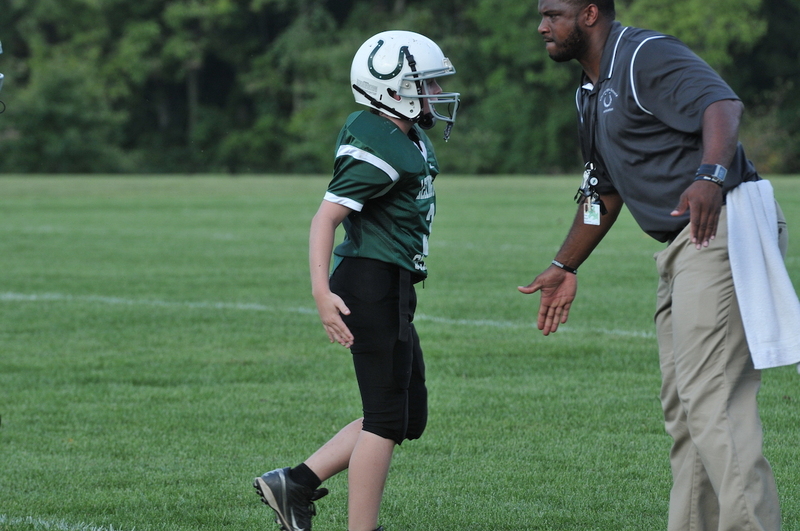 Words you hear at The Lexington School during fall athletic season are more like SPRINT, SET, SPIKE, TACKLE, and PASS. Action verbs lead to more action words: WORK, PRACTICE, and PERSEVERE. After all, Lexington School fall athletes are here to develop, learn, and grow. Some will continue into high school and club level athletics while others are playing for the first time. What all athletes at The Lexington School have in common is their curiosity and desire to play sports. Did you know that the Lexington School offers more athletic options than any elementary school in the region? Preschool through 8th grade, The Lexington School’s oldest student is about 14 years old. Its tallest student might be a little over 5’10”, and its strongest student is the new girl in 6th grade who just picked up a volleyball for the first time, or the 8th grade boy who joined the football team just this year, or the fourth grader who kept running the course even though she knew she’d finish last. Or maybe she’s in second place turning the corner, and to win the race she faces real adversity; she has to find that final wind. Athletics at The Lexington school is about winning, but not always the way you might think. Winning games is important because it means setting a goal and reaching it, feeling the thrill of victory, the reward after all that hard work. But winning at TLS also means taking that step to join the team in the first place. Participating. It means growing in the confidence that comes from trying something completely new, being a part of a team, working hard alongside a peer, challenging and rooting for each other, overcoming adversity, and completing a journey where new skills are intangible (Mission Skills) and crucial in completing the social, emotional, and physical development of these young people. To be clear, Lexington School athletics is an extension of the classroom, which means it is an extension of the school’s mission. Tom Parlanti, Athletic Director, talks about athletics philosophy: “We hire the best coaches to teach and motivate our kids. Because our kids trust their coaches, they want to please them in a way, so you can see the kids taking some risks, working hard, wanting to improve and learn more.” When athletes take risks, failure is inevitable, especially in sports when you simply can’t control all the variables. But the best part is what happens next. They learn to get back up, dust off their knees, and analyze how to improve. This process leads TLS athletes to grow into resilient, pliable people. This is why participation in athletics is so important. Meredith McCoun, Assistant Director of Athletics, talks about participation: “My favorite thing about this year’s fall line-up was the level of participation. More students than ever signed up for fall sports. Every single team roster was full. It makes me happy to see kids out there trying new sports, knowing what it’s like to be on a team, learning all those great life skills, and being active.” HALF. Roughly 50% of age-eligible students at TLS played sports this fall. This is literal ACTIVE learning. Boys Soccer had an overall record of 2 wins, 2 losses, 2 ties. A season highlight, according to coach Griffin Miller, was the team’s transformation from early to later season play. Early in the season, soccer Colts lost to Sayre 2-1. Undaunted, they knew they had a rematch at season’s end, so they focused and worked hard, and their perseverance paid off. They turned the tables on the Spartans, and TLS boys beat Sayre 7-1. Girls Volleyball had a winning season (7-2) with the only losses in regular season and league tournament to undefeated Trinity Christian. Coach Kathleen Rogers led the TLS girls A team to the League Championship, falling slightly short of the championship with a runner up finish. Coach Rogers was very proud of the numbers of girls who came out for the team and of their collective determination as they made their way through tough regular season and tournament play. Cross Country is a team sport, even if it looks like an individual one. This year’s runners were impeccably coached by Jim Kaiser and Tom Parlanti, and once again TLS showed well throughout the season and at State. Elementary girls team or 6th grade and under team finished 6th place overall at the state meet out of 34 teams. It was the highest finish of any school team from Lexington in every division this year at the state meet with the exception of the middle school girls where E.J. Hayes placed 5th in the state. “We had some really impressive individual runners on all the teams, but this 6th and under team really came together and made it happen on the state level,” Tom Parlanti said.